Northern Florida is a spectacular fishing spot, and Amelia Island in particular, is one of the best destinations. The immediate access to the Atlantic Ocean opens the door up for exciting sport fishing for big gamefish offshore, as well as smaller catches inshore. But it’s not only the open sea that makes fishing on Amelia Island incredible. The intricate waterways and marshes of the Amelia Island interior offer both fresh and brackish – fresh and salt water mixed – species of fish. Amelia Island is home to two amazing angler charters. These top-notch charters are the best in the business. If you have time, give one both a try on your Amelia Island vacation getaway. Below is a quick look at what these two anglers offer. Angler’s Mark Fishing Charter takes you out to sea in a 22-foot boat well-equipped to tackle all kinds of waters in and around Amelia Island. The Angler’s Mark is led by Captain Lawrence Piper, a local leader in fishing and a U.S. Coast Guard-licensed charter boat operator. He has years of experience inshore and backwater fishing on Amelia Island, including tying flies, casting, selecting the best lure, and knowing where to find and how to hook local species. Captain Piper focuses on light tackle inshore and backwater fishing, taking you deep into the marshland of the island. He provides everything you need for the trip. He only recommends you bring a pair of sunglasses and a hat – it can be quite sunny out on the marsh waters. The Angler’s Mark launches tours near popular docks with clean bathroom facilities if the kids need it. He encourages a family-friendly atmosphere and welcomes kids onboard. Captain Piper can teach parents and kids alike the techniques of light tackle fishing. He can answer simple to complex fishing questions, such as how to detect a weighty flounder resting on the bottom. Or how you can use fly rods to lure the redfish out from the oyster beds. Rates vary based on the season. You can go out for about $325 during low season from December to January. The rate goes to about $375 for high season from March to July. Captain Piper also offers reduced rates for sightseeing. You can head up along the river and through the marshes on the lookout for marine life and some fantastic views. Angler’s Mark is located at 10 Ash St., Fernandina Beach, FL 32034. Call for booking at (904)-557-1027. Amelia Angler is a choose-your-own-adventure kind of charter. Head out to the bay, challenge yourself with some deep-sea bottom fishing, stay in the rivers and local waterways to fly fish, or set sail from Fernandina Harbor Marina on a gorgeous sailboat for a relaxing cruise around the island. What kind of adventure do you want? Amelia Anglers is led by renowned fishing expert and conservationist Terry Lacoss. He has worked with many groups, including the National Oceanic and Atmospheric Administration and the Coastal Conservation Association, which seek to protect worldwide marine ecology with focuses on certain regions. The captain knows where to go and how to get the most out of your fishing adventure in the marshes or on the ocean. He welcomes children on his tours, offering family-friendly experiences of varying levels of difficulty. 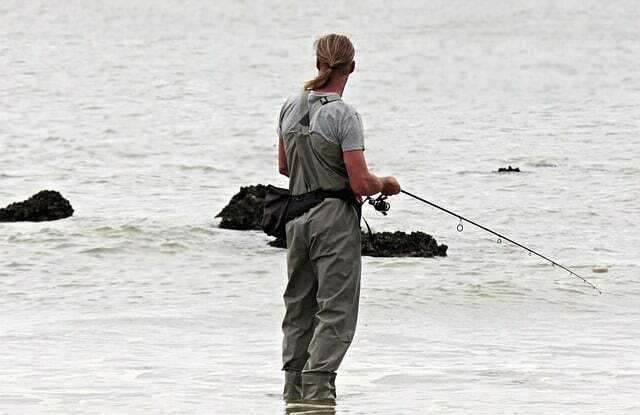 He is keen to teach kids if they are enthusiastic and interested and share his love for inshore fishing. For those wanting to learn more than an afternoon of fishing will permit, he offers a few fishing courses, including casting and fly fishing. Some tours offer sightseeing options for the non-fishers in the group. Take a trip with Captain Terry to Cumberland Island to see the wild horses or take a wildlife viewing trip on the Amelia River. You can even head up to neighboring Georgia for the afternoon. Amelia Anglers is located at 111 Centre St., Fernandina Beach, FL 32034. Reach them at (904) 261-2870 for booking info. You can also give us a call at your convenience at 800-741-4011 for help with planning your next fishing adventure on Amelia Island. We can help you find the perfect beachfront vacation rentals on Amelia Island for your next vacation getaway. If you’re coming with a four-legged friend, book one of our pet-friendly rentals, complete with modern amenities and immediate access to the wonderful beaches of Amelia Island. Many other lodging options await, just give us a call!